The Disney Channel Original Movie Let It Shine is now yours to own in DVD/Combo pack as of August 7th, 2012. If you missed its debut on June 15th on the Disney Channel, this is a DVD you will want to pick up for your whole family to enjoy. Cyrus DeBarge (Tyler James Williams) and his best friend Kris McDuffy (Trevor Jackson) have been following the career of their now famous former classmate, Roxie (Coco Jones). Her record label is sponsoring a song-writing contest to be held at the teen hip hop club where Cyrus works. Both friends decide to enter the contest, but it’s Cyrus’s song, voice, and lyrics with Kris’s looks that win the coveted spot. After Roxie’s label mistakes Kris for Truth, Cyrus wants to set the record straight; Kris feels he has a connection with Roxie that he’ll only be able to explore if Cyrus helps me masquerade as the singer/songwriter Truth. Reluctantly, Cyrus agrees to help his friend, but the more time Cyrus spends with Roxie, the more he falls for her, too. Let it Shine is a retelling of the classic play Cyrano de Bergerac by Edmond Rostand, with a dash of Footloose and a much happier ending than Rostand’s play. Cyrus is the son of a righteous preacher who feels that hip hop music is “of the devil”, so Cyrus has to sneak out of the house to bus tables at the hip hop club and hide a part of himself from his father that he could never understand. There are a lot of themes in this film that revolve around family, being true to yourself (Roxie, Cyrus, and even Kris explore this), and opening your heart to new people and experiences. You and your family will have a lot to talk about after you sit down and watch it together. Cyrus is easy to relate to; he has a talent, but he doesn’t believe in himself enough to show everyone what he can really do. He had so many opportunities to tell Roxie the truth, but up until he finally does, I enjoyed watching them connect with each other on a really deep level. I also loved the song that Cyrus wrote and submitted to Roxie’s label’s contest; Let it Shine has an inspirational, “feel good” soundtrack that is playing on repeat in my head. 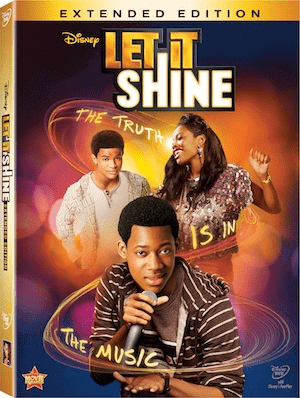 The next time you are looking for a movie that everyone in your family can enjoy and relate to, choose Let it Shine. Parents will see parts of themselves in Cyrus’s parents, and most teens will relate to Cyrus, Roxie, or Kris. I’m so glad with how everything worked out for these characters; I really liked each and every one of them! I received no compensation for this post. I received a sample of this product for review purposes. My opinions are based entirely on my experience with this product, and were not influenced in any way. I like the story line of this movie, and it looks really interesting to watch! I like Disney movies! I like the characters and that this movie teaches a good moral lesson. I would like to see this movie! This looks like a very entertaining and inspiring movie. My neices would love to watch this one.